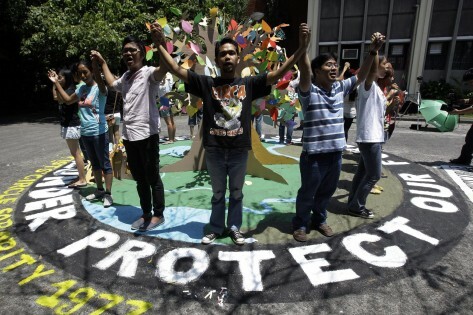 A group of students celebrate Earth Day in the Philippines. AP Photo/Pat Roque. A British Columbia group has told an international panel reviewing the environmental effects of NAFTA that the worst fears about the historic trade agreement’s impact on the environment have come true, especially under the federal Conservative government. West Coast Environmental Law has sent a submission to the Commission on Environmental Co-operation as part of the commission’s look back at the 20 years since a side deal was signed between Canada, the United States and Mexico in response to concerns that NAFTA’s environmental impact. “With new free trade agreements, such as the Trans-Pacific Partnership, in negotiation all around the globe, there is no better time to reflect on the ideas that led to the creation of the (commission) in 1994, considered by many as the first time international trading partners addressed concerns that free trade might harm the environment,” the commission’s news release said. But West Coast Environmental Law argues that’s exactly what has happened. In a submission filed Wednesday, the group argues the federal Conservatives violated the agreement by introducing changes in two omnibus pieces of legislation. Specifically, the group points to changes to the Fisheries Act, which it says will inhibit the protection of fish habitat, and changes to the way Canada conducts environmental assessments. The group says those changes will mean there will be thousands fewer assessments, including on projects the groups says could have major environmental impacts, such as oil and gas pipelines. “These changes weaken environmental protection and public involvement, despite Canada’s commitment. . . to the appropriate assessment of environmental impacts,” West Coast Environmental Law’s lawyer, Andrew Gage, writes in the submission. The group also takes the NAFTA side agreement — known as the North American Agreement on Environmental Co-operation — to task for being toothless. Gage writes that there has been no response to Canada’s legislative moves. “While the commitment to enforce environmental laws is indeed a crucial piece of the (North American Agreement on Environmental Co-operation), the agreement does not contain any remedy for members of the public when a government violates the many other commitments found in it,” the letter says. West Coast’s letter to the commission comes a day after environmental activists launched a lawsuit in the Federal Court of Canada challenging new federal legislation they say limits their ability to oppose pipeline projects at regulatory hearings. The lawsuit, which will be mounted by noted Toronto lawyer Clayton Ruby, was filed by ForestEthics Advocacy and activist Donna Sinclair. The legal challenge argues provisions of the National Energy Board Act be struck down. The act was among the omnibus budget bills that Gage’s group refers to in its commission submission. Ruby has said he plans to argue the limits on opposition to pipeline projects violates charter freedoms. Gage said in an interview Thursday the back-to-back challenges of Harper government policies were happenstance, not part of a co-ordinated effort to have the measures struck down. And he acknowledged it’s unlikely the commission will be able to pull Canada into line with the commitments outlined in the NAFTA side agreement. Gage noted that although the changes included in Bills C-38 and C-45 — which he says “gutted” environmental protections in Canada — have been passed in Parliament, some of the provisions that environmentalists find most egregious have not been enacted. What are the environmental successes of NAFTA and where have those agreements fallen short? Is the commission meeting its mandate and is its mandate adequate in light of ongoing environmental challenges in North America? How could the environmental provisions of NAFTA be improved?